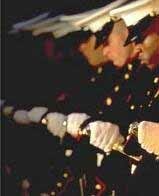 Semper Fidelis—Always Faithful. The Few. The Proud. The twelve year old girl’s father sat there looking at me as if I was something scrapped from the bottom of a slimy trashcan. “Were you in the Marines?” I asked. He looked suspicious and said yes. I pulled out my old Marine Corp ID, which I still carried. The volcanic atmosphere vanished and the air-cooled. We spent the next half-hour talking about the Marines and Vietnam. Simper Fi was stronger than his daughter’s attempt to get rid of me with lies and deceit. Just as I was starting to gain control, the regular teacher returned. She had released herself from the hospital and demanded her job back. A month later, she left after a second breakdown. I was called again. I asked for a written guarantee that the regular teacher wouldn’t be coming back. They couldn’t give it to me. I turned the job down. If you didn’t start reading this four part series with “It’s the Parents, Stupid“, click here.